Beer. After water, it’s the world’s most popular beverage. I’m on a mission to see if I can help slide it into the number one spot. In this blog I’ll explore the rich culture of beer, learn about beer brewing traditions and their diaspora, visit various venerated beer establishments, and meet the people involved along the way. Cheers/Santé/Vô/乾杯/Salud/干杯/Prost! While sitting at my tiny desk in my tiny apartment in the big city of Tokyo, I had a big idea. A big idea about something people like myself (aka advanced beer drinkers, or as I like to say, "brewrus") need to know: the beer scene in Japan is flourishing and full of delicious surprises. What better opportunity to spread this knowledge than with the best Japanese beer I've had yet? Yona Yona (trans. "every night) Ale has something for all beer enthusiasts, whether they be sitting on the front porch on a hot day just looking for a cold one or trying to impress their beer-snob friends with a surprisingly sophisticated yet accessible beer. Yona Yona Ale is made by Yo-Ho Brewing Company, based in Karuizawa, Nagama, Japan. The brewer, who apparently goes by "Toshi", served as an apprentice at Stone Brewing Co.- a well respected CA brewery that has mastered the pale ale (along with a few other styles). With one glass of this stuff I can tell that Toshi was a quick study. The beer itself has amber and golden hues. Honey malts and sweet grapefruit dominate the aroma, but when you sip it light hints of pine-needle evoking flavoids step in for a slow dance to this brew concerto. 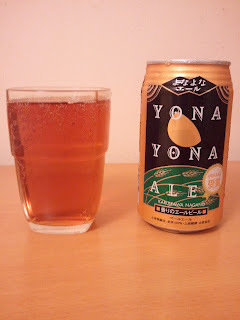 Overall, this beer exemplifies exactly, EXACTLY, why Japanese beer is gaining some worldwide respect. High five to Toshi for a job well done. High 5 to Toshi! That beer sounds delicious! © 2011 Grant Toeppen. Keep your grimy mitts off!. Awesome Inc. theme. Theme images by mammuth. Powered by Blogger.